Samsung today announced its very first line of co-branded tablets, called Galaxy Tab 4 Nook. As you’ve probably guessed, the new tablets are made in collaboration with Barnes & Noble - which stopped manufacturing its own slates a while ago, but recently said that it would keep the Nook brand alive thanks to “world-class hardware partners.” Well, it turns out that Samsung is one of those partners. The first Galaxy Tab 4 Nook tablet (pictured on the left) is expected to be released in the US in August, and seems to be based on the Galaxy Tab 4 7.0 that’s already available to buy for $199.99. 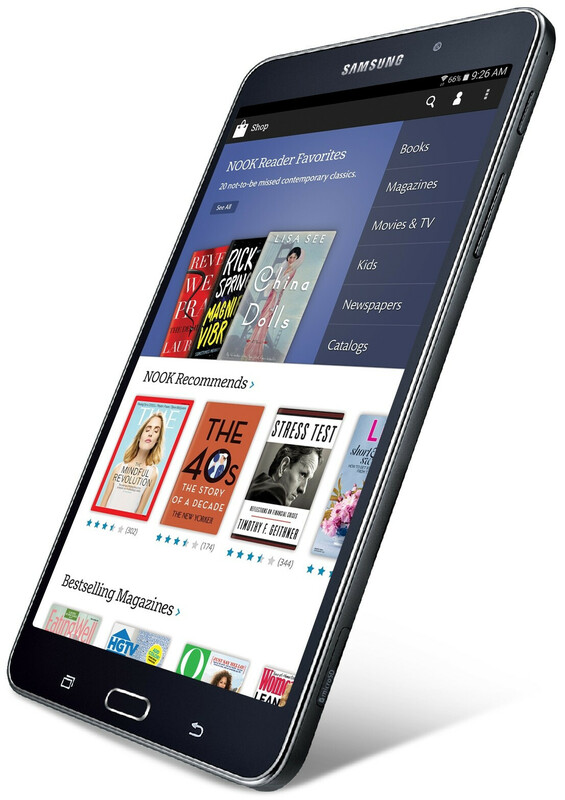 The device will offer customized Nook software, providing “easy access to Barnes & Noble’s expansive digital collection of more than three million books, leading magazines and newspapers.” Customers will be able to find Galaxy Tab 4 Nook slates at Barnes & Nobles bookstores across the US, as well as online at bn.com. “We are very excited and proud to partner with Samsung, a world-class technology and tablet leader, to create customized co-branded devices featuring our valuable Nook reading experience and digital content catalog for Barnes & Noble customers nationwide. Standing behind these great new devices will be the power of our 40,000 Barnes & Noble booksellers combined with our deep bookselling and retail expertise to provide sales support and personalized in-store customer service for our lineup of new Samsung Galaxy Tab 4 Nook products,” said Michael P. Huseby, CEO of Barnes & Noble, Inc.
It’s not clear how much the first Samsung Galaxy Tab 4 Nook tablet will cost, but we guess its price won’t be too different from the price of the regular Tab 4 7.0. So, what do you think, is a Nook reading experience on a Galaxy Tab something to look forward to? Well, as I've gone from my Mega 6.3 to a Galaxy S5 ( which is awesome ) .. I think I might buy a compact tablet just for easy use at work as I don't want also to bang "my precious" here and there, a Tab 4 7.0 or 8.0 is considerable now.. don't know about the nook thing though. I read tons of books but still if it's priced higher than the regular one, the regular one will then be better. Really? A Samsung expert like you want to get rid the S5 and Note 3 for an HTC M8? That's surprised me. The S5 still a fresh flagship, why do you want to get rid of it? I wish I could get rid of my old phone for a m8..
Holy God! Your old phone is the legendary N73, how long do you own it? What the h*ll man? you'll regret it specially when it comes to camera and Amoled among many other things .. What's wrong with your GS5 :/ ? You know as much as I love samsung, I encourage your change. Sometimes you want to try new things. Something is strange, l checked in his profile 'http://www.phonearena.com/user/PapaSmurf/phones' he only had an HTC Sensation 4g and wants iP6 and iP5s, this indicates that he is not an HTC fan. You're getting rid of three gadgets for ONE One M8? He is not an HTC fan and the M8 is not exist in his phone list. His account could be possibly hacked by someone(an HTC fan). Yes, I guess his account is hacked too. Its hacked because who would do that. what's wrong with the ipad mini 2? Nothing wrong with iPad mini2, but it's much better than iPad mini which use to lag and stutter. How do you know the original iPad Mini does lag and stutter? All of the iPhones and iPads doesn't have any lag and stuttering problem in the ui. i thought you hated the camera, so whats making you join us on the dark side? and honestly, why the note? I have both the S5 and the Tab pro 8.4, and for me it is the best Android tablet out there in the market. I was going for the pro 10.1 but as soon as I tried the 8.4 at best buy, I knew what I was going to buy. Great screen, nice grip, thin, much lighter than its bigger brother, and I love the iR blaster on this thing, I have the full tv guide on my tablet (the S5 can do that as well). The only con I can think about is the speakers placement, I wish Samsung went with the front facing dual speakers like they did with the original Note 10.1. I'm curious about the first comment in this article. Well I'm glad that the Nook line lives on through a partnership with Samsung. I was kind of concerned about Barnes and nobles stance in the world once they announced the shut down of producing their own tablets. What really sucked is that I had referred a friend of mine to buy a Nook HD+ the 9" tablet a week before they shut down the program.